Called Elseetoss by the nearby Cherokee tribe, Mount Pisgah gained the current name from the early European settlers. The name comes from the mountain Moses ascended in the Bible. In 1897, George Washington Vanderbilt purchased land that included Mt. Pisgah from Thomas Clingman for his growing estate, but Vanderbilt’s widow gave the land to the Forest Service upon his death two decades later. From certain viewpoints, two smaller peaks appear to be climbing Mt. Pisgah. The peaks resembled the shape of a rat, so this scenic landscape view received the name Mount Pisgah and the Rat. Some postcards from the early 1900s featured Mount Pisgah and the Rat on the front. Mount Pisgah and the Rat postcard published by the Asheville Post Card Co. Click the picture to jump to the source. Hunting, hiking, and camping were popular recreational activities the population enjoyed in the early twentieth century, as people still take part in them today. Mt. Pisgah has trails that scale up the mountain. One of mile plus trails accesses the site where the hunting lodge once rested. Another trail brings hikers back to the Mt. Pisgah Campground, a place that was once called the Frying Pan Gap Camping Area, situated near Mt. Pisgah and Frying Pan Gap, during the first half of the twentieth century. Local citizens that prefer to stay indoors for entertainment receive benefits of the mountain, too. In 1953, a television transmitter was installed on the top of Mount Pisgah, which makes the mountain more identifiable. 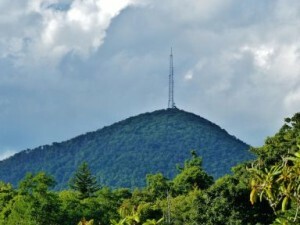 Other antennas added to the peak including a radio, the educational channel for University of North Carolina at Asheville, the National Weather Service. The Federal Bureau of Investigations added a tower to the top of Mt. Pisgah. Around Mt. Pisgah, there are notable sites related to the Vanderbilt family, including the Cradle of Forestry and the Buck Spring Lodge . The Cradle of Forestry was a site of the former Biltmore School of Forestry established with the permission of George Washington Vanderbilt. The Buck Spring Lodge was built for hunting and hosting guests for the Vanderbilt family. Blue Ridge Parkway officials tried to expand to Mt. Pisgah as early as the 1930s. Their plan, however, was not fully developed until the 1950s. Major road construction occurred from 1953 to 1955. 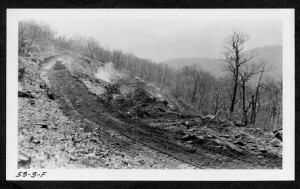 Constructing the Blue Ridge Parkway in Mt. Pisgah (1953) from Driving Through Time, Click the picture to jump to the source. In 1952, the Blue Ridge Parkway commission proposed the first preliminary plan to create a recreational area around the Pisgah National Forest Inn as it was known at the time. The plan included a gas station, camping facilities and hiking trails. In March 1959, they crafted another plan to expand the Pisgah Inn and create a comprehensive recreational area as a gateway to the many recreational activities on Mt. Pisgah. Land concession occurred from 1959 to 1962 and it included the transition of ownership from the National Forest Service to the National Park Service and the agreement to reconstruct the Pisgah Inn. 1797: Mt. Pisgah is privately owned. 1830s: Thomas Clingman purchases the summit of Mt. Pisgah. 1888: George Washington Vanderbilt acquires the land near Mt. Pisgah. 1896: Buck Spring Lodge built by George W. Vanderbilt. 1898: The Biltmore Forest School is established by Carl Alwin Schenk. 1911: The passing of the Weeks Act; This legislation permitted the U.S. Forest Service for the first time to purchase forest lands. 1914: the Forest Service purchases nearly 80,000 acres, including Mt. Pisgah, from Edith Vanderbilt as a part of what is now the 479,000-acre Pisgah National Forest. 1919: George Farrington and Mary Wheeler Weston found the Pisgah National Forest Inn, later known as the Pisgah Inn. 1937: The Pisgah National Forest Inn sold to H. H. Nash and Harold Moon. 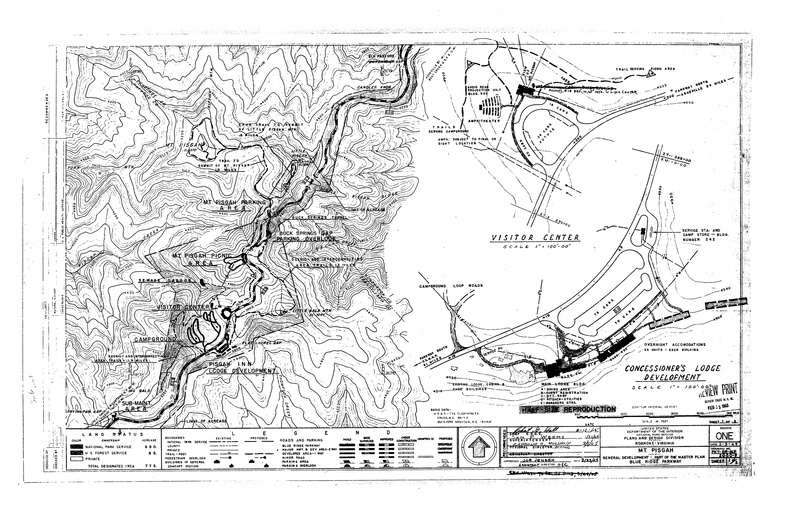 1952: A preliminary development plan is crafted to design a recreational area in Mt. Pisgah. 1953:A television transmitter is added to the top of Mt. Pisgah. 1958: Edith Vanderbilt dies and the National Park Service acquires the Buck Spring Lodge and property from the Vanderbilt family. 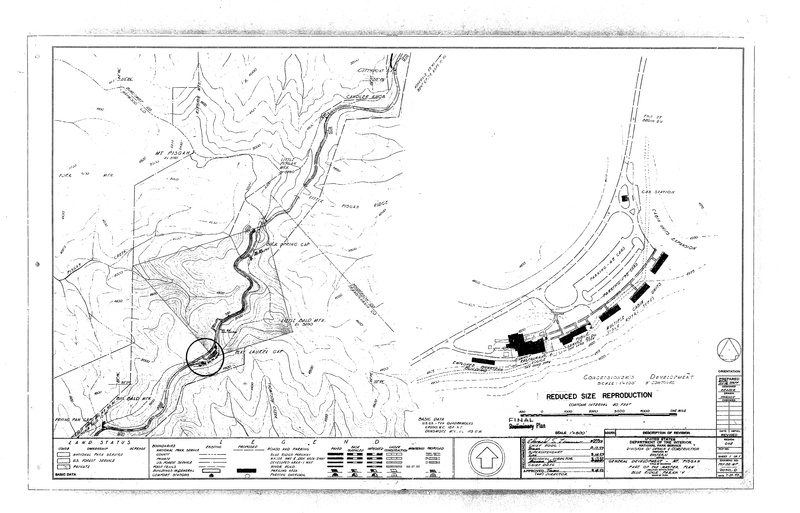 1959-61: Another plan of the Mt. Pisgah development is written. The land concession from the National Forest Service to the National Park Service begins. 1962: A concession is made between the Kirschners and the Blue Ridge Parkway to preserve the contemporary inn building while creating a new one. The Pisgah Inn is the only lodging facility in the Mt. Pisgah recreational area. Originally the Pisgah National Forest Inn, the inn has changed its name and owners several times yet has continued to provide accommodation for tourists for almost a century. As major land concession for the Mt. Pisgah recreational area occurred between federal institutions, the National Forest Service and the National Park Service, there are few records that indicate conflicts. However, the case of the Mt. Pisgah Inn shows a glimpse of uneasiness caused by the development of the area. In 1959, Blue Ridge Parkway officials crafted a recreational area plan with the intent to build a new lodging facility for the Pisgah Inn in a different location. Leslie G. and Leda D. Kirschner, the owners of the Pisgah Inn at the time were reluctant to agree to this plan. Leslie and Leda Kirschner from left to right, Forestry in Western North Carolina, click the picture to jump to the source. The new Pisgah Inn building and a parking lot (1973) from Driving Through Time, Click the picture to jump to the source. One of the issues was the original building. The Kirschner family had invested their money to renovate their facilities since 1955. However, Blue Ridge Parkway managers regarded the building as too old to accommodate future visitors. The Kirschners were also concerned about the land transition from the National Forest Service to the National Park Service. The family had little experience in land transitions and worried about obtaining land use permission from the new federal agency. The new recreational area plan had a potential to attract more visitors to the Pisgah Inn. However, the plan also showed a possible change in the operation of the inn. 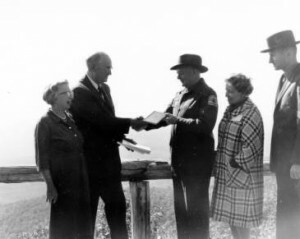 In 1962, the Kirschners finally made a concession with the Blue Ridge Parkway officers. They agreed to preserve the contemporary inn facilities while building a new building in the area. The new building. In 1987, the old inn was demolished due to its decrepit structure. 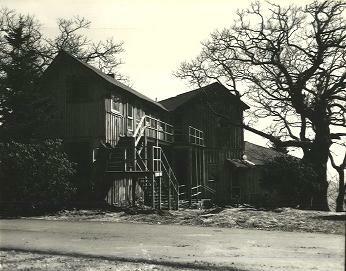 The original Pisgah Inn building before being demolished (1981) from Driving Through Time, Click the photo to jump to the original source. “During my travels to Mt. Pisgah during the required site visit, I could not help but notice the well built and maintained trails, parking lot, and visitor information boards. However, the major difference I was able to take note of was how much more attention is given to the Mt. Pisgah hiking trail rather than the Shut-In hiking trail. Another noteworthy difference is the popularity between the two trails and the amount of foot-traffic each receives. The signage for the Shut-In Trail is strikingly minimal and very unkempt. However, in comparison, upon my hiking of both trails, it appeared as though the Shut-In Trail contained a plethora of wildlife, both flora and fauna, compared to Mt. Pisgah. Similarly, the trail is much more overgrown and not as sturdy in places. The Shut-In Trail is a bit unknown, and to discover the trail, one must have previous knowledge of it, or luckily meander to its opening. Moreover, the Mt. Pisgah site appears to be well off and is constantly attended to by both park rangers as well as tourists and the general public. The popularity of the mountain and its rich history, combined with the proximity of the Pisgah Inn, allow for an easy mountain getaway and provide ample hiking, dining, lodging, camping, and educational opportunities. Just as the Kirschner family was worried about becoming concessioners of the National Park Service, there has been a continued tension between private business owners and the National Park Service. In an August 13, 2014 interview with the Smoky Mountain News, Bruce O’Connell lamented the difficulty he faced in renewing his contract with the National Park Service. The major problems for independent business owners like O’Connell are 1) competition with large chains and 2) legal complications from the National Park Service. Individual owners tend not to have professional experts who can keep up with ongoing changes in legal issues and environmental regulations. According to O’Connell, “there’s so much out there that I don’t have knowledge about that I would not be able to provide the same level of proposals that a professional would.” (Smoky Mountain News, “A Concessionaire’s Conundrum,” August 13, 2014) While Bruce O’Connell gained a 10-year permission on Sep 10, 2014. This tension will likely continue in the future. Arthur, John Preston. Western North Carolina;a History (from 1730 to 1913). Raleigh, N.C., 1914..
Asheville Post Card, Co., Asheville, N.C. “Mount Pisgah and ‘The Rat. '” Undated, North Carolina Postcard Collection, Wilson Library, UNC-Chapel Hill. Historic American Engineering Record. Historic American Engineering Record (HAER): Blue Ridge Parkway HAER No. NC-42, 1997, 273-279. http://lcweb2.loc.gov/master/pnp/habshaer/nc/nc0400/nc0478/data/nc0478data.pdf (Accessed December 2014). Kays, Holly. “A Concessionaire’s Conundrum: Pisgah Inn Owner Hoping NPS Contract Renewal Yields 10 More Years of Local Ownership.” Smoky Mountain News, August 13, 2014, http://www.smokymountainnews.com/news/item/14046-a-concessionaire-s-conundrum-pisgah-inn-owner-hoping-nps-contract-renewal-yields-10-more-years-of-local-ownership (Accessed December 2, 2014). ————–. “Pisgah Inn Contract Renewed.” Smoky Mountain News, September 10, 2014. Miller, Joe. 100 Classic Hikes in North Carolina. Seattle, WA: Mountaineers Books, 2007. Ostendorff, Jon. “Pisgah Inn Operator Faces Contract Fight,” Citizen-Times, June 11, 2013, http://www.citizen-times.com/story/news/local/2014/06/11/pisgah-inn-operator-faces-contract-fight/10333523/ (Accessed December 2, 2014). Smathers, Garrett T. “Old Pisgah Inn (Lodge).” Driving Through Time, March 10, 1981. http://docsouth.unc.edu/blueridgeparkway/content/6811/. (Accessed December 2, 2014). Spencer, Marci. Pisgah National Forest: A History. Charleston, SC: The History Press, 2014. Westveer, C.E. 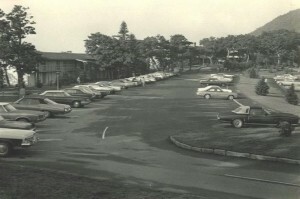 “Pisgah Inn Parking Lot & Visitor Accommodations.” Driving Through Time, August 6, 1973, http://docsouth.unc.edu/blueridgeparkway/content/6819/ (Accessed December 2, 2014). W.P.W. “Road Construction: Winding Dirt Road.” Driving Through Time. 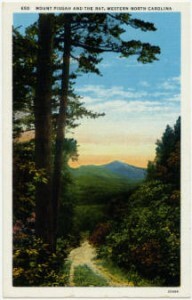 April 3, 1953, http://docsouth.unc.edu/blueridgeparkway/content/7733/ (Accessed December 2, 2014). Unknown. “General Development-Mt. 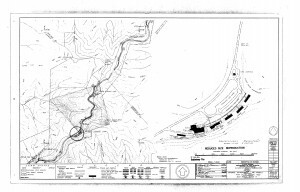 Pisgah Part of the Master Plan,” July 29, 1959. National Park Service, eTIC, Denver, CO. Unknown. “Mt. Pisgah General Development Part of the Master Plan,” February 3, 1965. National Park Service, eTIC, Denver, CO. Unknown. “Parkway Group On Inspection of N.C. Route.” Asheville Citizen Times. May 22, 1934. Driving Through Time. http://docsouth.unc.edu/blueridgeparkway/content/6579/ (Accessed December 2, 2014).